What’s in a coffee label? Brand, price, flavor, ethics and sustainability. As a teenager, I drank instant coffee. I would scoop a tablespoon of those generic, store-brand coffee crumbs into a mug, pour water into it and then microwave it for a minute. I only drank it for the caffeine, gulping it down to wake up my drowsy brain as I rushed to get ready for school. At the time, I didn’t even know coffee could be enjoyable. As I got older, I brewed my own coffee, but never with a consideration for where the beans had come from. I bought whatever was on sale: Folgers, Chock Full O’ Nuts, Maxwell House, etc. Consumer consciousness is a gradual dawning for many people, and it wasn’t until a few years ago that I started to think about where my food came from, the long journey from soil to shelf and the ramifications of my purchases: how what I purchase can reinforce or disrupt the status quo. I started to wonder: why were certain brands more expensive than others? What warranted the terms “organic” and “ethical”? What was behind all the certifications and marketing? I started to learn that coffee is a vast, international industry. It’s the 2nd most traded commodity in the world, after crude oil. It’s grown in many different countries from Brazil to Vietnam to Ethiopia. And, unfortunately, many brands source coffee beans from industrial farms that barely pay workers and use pesticides and other corrosive methods, which is unsustainable, unethical and unhealthy. So I started buying “Fair Trade” and “Rainforest Alliance” when I could, because I knew they had to be more sustainable and ethical. But I still didn’t know the finer details of what these terms meant. None of these labels are perfect and there are inherently going to be holes in all international vetting systems. Some programs prioritize environmental sustainability, others advocate for worker rights. Nearly all certifications, however, are striving to improve how this essential commodity is produced, packaged and traded. 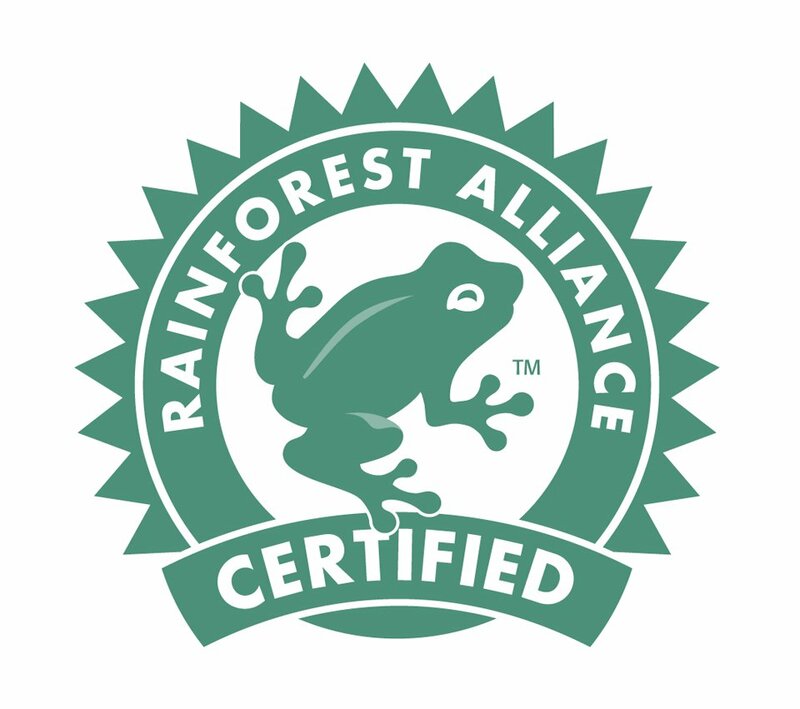 When you buy Rainforest Alliance Certified Coffee, you’re buying environmental sustainability. The Rainforest seals means these beans were grown in a way that promotes the health of ecosystems. The program covers ecosystem conservation, wildlife protection, water conservation and soil conservation. So farmers cannot use synthetic pesticides or fertilizers that would pollute the soil and waterways. They must allow their farms to be habitats for animals and diverse plant life. They must replant and encourage the growth of trees. And waste must be managed in an environmentally beneficial way. Ultimately, it comes down to restoring the land to natural conditions, which, as it happens, produces more complex and flavorful coffee beans. Many farms have a hard time meeting these standards, but since Rainforest Alliance is not afraid to revoke certifications, they do their best. Here’s a list of Rainforest Alliance brands. While the Fair Trade certification encourages sustainability and environmental health, its main focus is improving worker rights. When you buy Fair Trade coffee you know that you’re buying coffee that was farmed by people who are treated and paid fairly, so you are contributing to more vibrant, empowered communities around the world. Fair Trade operations have to operate democratically, pay workers at least minimum wage and help workers live reasonably. Fair Trade also tries to reduce the sway of multinationals by allowing cooperatives to bargain directly with their buyers. Here’s a list of Fair Trade brands. I buy Stop & Shop's "Nature's Promise" coffee. USDA Organic coffee is another environmentally stringent model. Coffee that receives this seal has to use the most modern renewable energy sources, conserve the health of ecosystems and avoid all synthetic products. USDA Organic extends throughout the supply chain to ensure that the coffee beans do not come into contact with artificial substances. Here’s a list of USDA Organic brands. Quality Assurance International is all about environmental protection as well. From bean to shelf, QAI ensures that a coffee is being produced, handled and supplied in a sustainable manner. Just like Rainforest and USDA, QAI encourages workers rights throughout the process. Environmental benefits workers by improving their ability to negotiate for better prices and reducing health risks. This, in turn, lifts up communities. Here’s a list of QAI brands. This is probably the rarest mainstream coffee certification, and, as a result, probably the highest quality. It ensures ethical and sustainable conditions. Smithsonian sold 10.9 million pounds of coffee in 2011, compared to Rainforest’s 827 million. This program calls for farmers to plant many different kinds of trees to provide ample shade and living space for animals, most importantly birds. To foster and maintain healthy ecosystems, farmers must use entirely organic methods. No pesticides or synthetic products are allowed. Here’s a list of Smithsonian Bird Friendly brands. These brands may cost you a few extra dollars, but it’s money well spent. As a consumer, it’s good to remember that every purchase has an impact. When you support ethical and sustainable brands, you’re allowing them to grow and bring more workers and land under their sustainable care. Over time, this can lead to dramatically better working conditions for people around the world and a more sustainable food supply through better land management. As an individual, you may not think your decisions matter. But they do. They send a message both to the people around you and to the companies buying and selling products around the world. The more you send a message that ethics and sustainability matter to you, the more likely people in power will listen. Plus, coffee that’s cultivated with care tastes sooooo much better. So many more flavors. So much more depth. So much more goodness.